The top U.S. nuclear commander said Saturday he would push back against President Trump if he ordered a nuclear launch the general believed to be "illegal," saying he would look to find another solution. 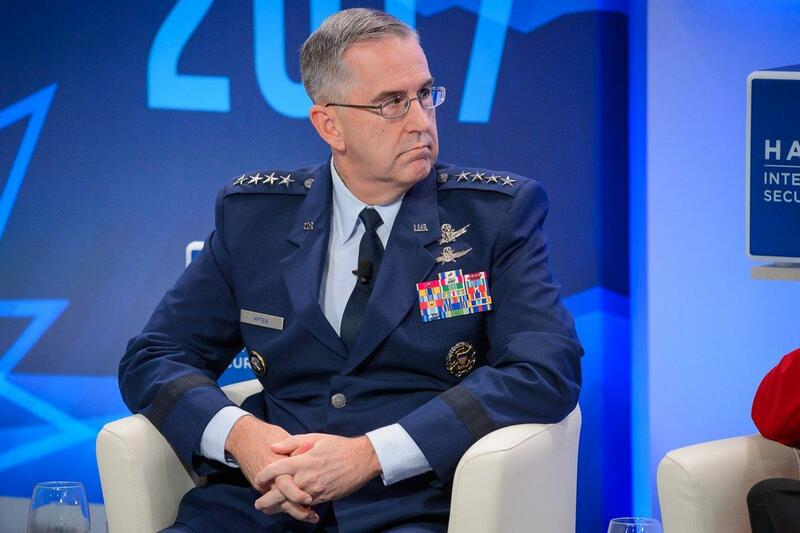 Air Force Gen. John Hyten, commander of the U.S. Strategic Command (STRATCOM), told an audience at the Halifax International Security Forum in Halifax, Nova Scotia, on Saturday that he has given a lot of thought to what he would say if a president ordered a strike he considered unlawful. "I think some people think we're stupid," Hyten said in response to a question about such a scenario. "We're not stupid people. We think about these things a lot. When you have this responsibility, how do you not think about it?" Hyten was responding to a question about testimony by former STRATCOM commander retired Gen. Robert Kehler before the Senate Foreign Relations Committee earlier this week. Kehler said that nuclear operators would refuse to implement an unlawful order. Hyten agreed, and argued that the process in place to launch a nuclear strike would prevent such a situation from arising in the first place. As head of STRATCOM, Hyten is responsible for overseeing the U.S. nuclear arsenal. "I provide advice to the president, he will tell me what to do," Hyten added. "And if it's illegal, guess what's going to happen? I'm going to say, 'Mr. President, that's illegal.' And guess what he's going to do? He's going to say, 'What would be legal?' And we'll come up with options, with a mix of capabilities to respond to whatever the situation is, and that's the way it works. It's not that complicated." Hyten said he has been trained every year for decades in the law of armed conflict, which takes into account specific factors to determine legality -- necessity, distinction, proportionality, unnecessary suffering and more. Running through scenarios of how to react in the event of an illegal order is standard practice, he said. Hyten's comments come against the backdrop of continued tension with North Korea. In the past, the president has pledged to unleash "fire and fury" and to "totally destroy" North Korea if necessary. Hyten's comments also come as Congress is re-examining the authorization of the use of military force and power to launch a nuclear strike. Hyten said the U.S. military is always ready to respond to the threat of North Korea, even at that very moment. "And we are ready every minute of every day to respond to any event that comes out of North Korea. That's the element of deterrence that has to be clear, and it is clear," Hyten said. But Hyten also said handling North Korea and its unpredictable leader Kim Jong Un has to be an international effort. Mr. Trump has continued to put pressure on China to help manage its tempestuous neighbor. "President Trump by himself can't change the behavior of Kim Jong Un," Hyten said. "But President Trump can create the conditions that the international community can reach out in different ways where we can work with the Republic of Korea, where we can work with our neighbors in the region."